Camping trips should be an exciting adventure and a great way of getting away from the stress of daily life. I fondly remember going camping with my family as a kid, yet when it came to my first RV trip as an adult I felt overwhelmed, to say the least. Trying to figure out what gear I needed, what meals to make, and trying to find the right campground felt like a struggle at first. Thankfully, the majority of the beginner mistakes can be avoided by planning ahead. A pearl of wisdom suitable for every camper, regardless of experience, is to put together a camping gear checklist. Nothing puts a damper on the mood than forgetting your shower towel or realizing you didn’t pack enough lights. Forgetting something more serious, like your tent poles, could bring an end to your trip before it even begins. Every camper’s essentials list will differ from the next, but using a standard checklist of basic gear will help you get started. If you’re camping with children a family-oriented checklist will help you remember the extra gear your kids will need. You can easily add extra gear you might need onto a basic printable. It can be helpful to have family members or friends you’re camping with reading over the list to make sure you haven’t forgotten any key times. Once you know what gear you need it’s a wise idea to go through a practice run in your backyard or even your living room. You want to know how all of your equipment works and be able to use without much trouble. 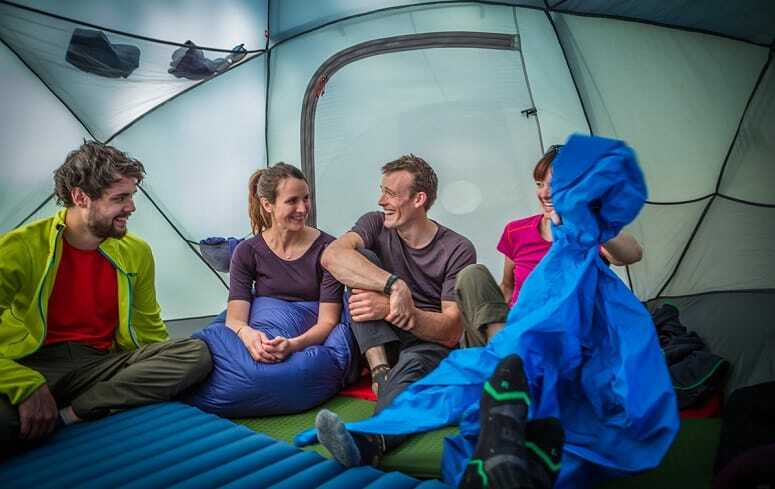 Your tent is the main piece of equipment you definitely want to know how to set up correctly. Also check your bedding, like sleeping bags and camping cots. Setting up and staking your tent improperly may damage the tent itself, collapse, or blow over in high winds. Every tent will have slightly different instructions, so be sure to read the instructions of your model before you begin to play around with the poles. Setting up larger capacity tents is easier with a helper, but you can certainly do it on your own as well. Other gear to test out includes your camp stove, water treatment system, camping hammock set up, and any other similar items. You don’t want to lose your light because you forgot to check batteries on your camping lantern. Something that new campers probably aren’t aware of is how deceptive tent capacity can be. When you’re shopping for a tent you’ll see some type of capacity in the model name, like 4-person or 4P. You’d assume this means the tent would be perfect for you and 3 others, but this isn’t quite true. Tent capacity should be considered the maximum number of occupants rather than the ideal. A standard 4-person tent is much more appropriate for two adult campers with some gear than four adults. A general guideline to follow for new and casual campers is to select a tent that is rated for two occupants more than you’ll have. If you’re camping with young kids you may be able to get away with one occupant larger, unless you’re camping with a bulky crib. I know firsthand how unexpected rain can really make a camping trip feeling like a downer. Once you know what day(s) you’d like to camp, always check a trustworthy weather forecast provider to see what you should expect. Being a new camper, chances are high that you’ll be camping around summer time. That means that rain is likely to be the only weather event that might affect your trip. Even if the forecast doesn’t show a chance for rain, you should always be prepared just in case. At a minimum, you should make sure your tent has a water-resistant surface treatment and you have a rain jacket for each person. If there is a fairly good chance of rain then bringing along a tarp to string up will come in handy so you won’t be stuck in your tent. 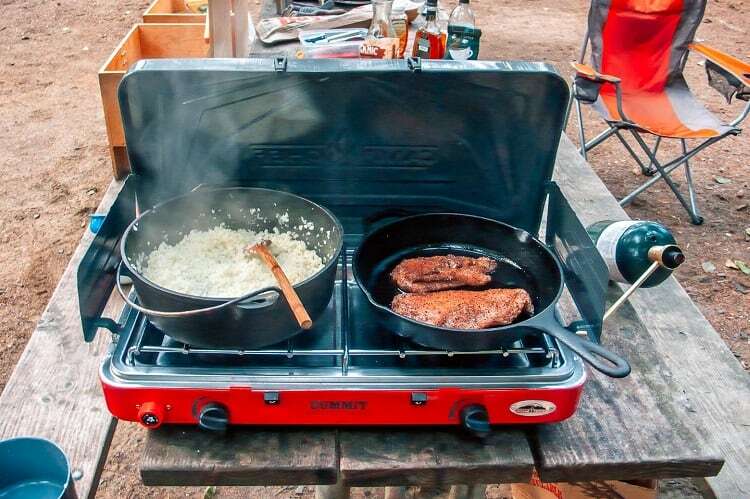 Another mistake I’m guilty of is getting over-ambitious with my meal plan while camping. Camping trips are usually a social event and with that comes gathering around the campfire to chow down on some tasty food together. If you’re already a bit of a home chef it can be really tempting to want to try out some extravagant recipes. My advice would be to forget about the more complicated or ingredient-heavy meals at first. Look for easy recipes with fewer ingredients to worry about. As you get more experienced cooking on the campfire, you can experiment with more elaborate meals or try out dutch oven recipes. I highly recommend camping with RVs, trailers, or even just large trucks practice parking and reversing before they reach their campsite. You might be able to drive through town fine or park in a spacious RV-designed paved parking spot, but maneuvering at a campsite is tricker. As someone who has first-hand experience nearly getting a camping trailer stuck, I want to be sure to save you the same embarrassment. Unless you have the time to get a lesson from an RV driving instructor, YouTube will be your best friend when it comes to virtual driving tips. Once you get the basics down, be sure you’re especially comfortable with parking and reversing into a campsite. The smell of a campfire is instant nostalgia and there’s little doubt that new campers will be looking forward to building one. But there are right and wrong ways to go about building one. The importance of campfire safety can’t be stressed enough and many campgrounds will also have their own rules that you’ll need to follow. You must also consider local fire conditions, regardless of whether you’re staying at a campground or not. Even if the campground doesn’t have a warning posted, if the local conditions cause high fire danger, don’t risk it. I’ve found that buildings campfires can actually be quite fun. Aside from the basic fire, there are a number of different styles to try out if you’re up for experimenting. Planning a camping trip can make anyone feel wanderlust, but for your first trip or two, it’s a good idea to stay close to home. This is namely for safety and convenience reasons. By staying at a local campground you can pack up and drive home if an emergency happens. This could be because of a surprise change in weather and abruptly finding out your tent isn’t waterproof. Or it could be that those hotdogs you had at dinner didn’t really agree with you. It might seem like a random tip to include, but it’s one that many seasoned campers have learned the hard way. Always include shower shoes and some quarters in your essentials list so you don’t forget them! As a new camper, you’re probably staying at a campground that has some amenities, like showers. Taking a hot shower after getting dirty all day is wonderful, but not so much if you realize you don’t have any quarters on you. Not all, but most campground showers will require quarters for payment. More modern sites may allow for a card, but these are pretty rare. As for the shower shoes, these can be super simple plastic flip-flops or sandals. The purpose of these is to have something to protect your feet while you’re showering. Just like a locker room floor, campground showers is a breeding ground for fungus and bacteria that you definitely don’t want to be walking on. A camping trip is a great way to unplug and take a break from your phone, but new campers should try and choose a site within their service coverage. 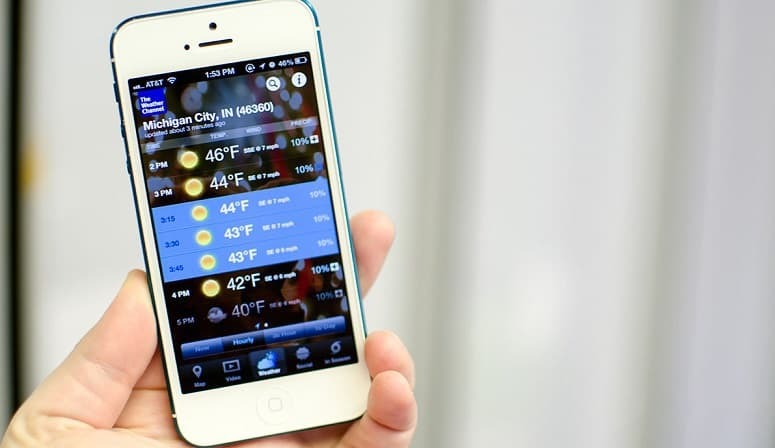 This serves two purposes – ensuring you can make phone calls and to easily view maps. In the event of an emergency being able to make a phone call can be a literal lifesaver. Having a working phone is also handy for checking local maps if you choose to not use a handheld GPS. Having mobile service can also be fun for new campers who want access to help YouTube videos when it comes to cool camping tricks, cooking, fishing tips, and more. You don’t need to get to your campsite at the crack of dawn, but it’s a good idea to try and arrive as early as you can. By arriving early you’ll have a better selection of campsites, be able to get your campsite set up without rushing, and have the day for exploring. It’s a good idea to first get the lay of the land and find where the campground amenities are as well as what trails lead to them. You can also go for a hike with your group to any notable landmarks surrounding the park. If work or other responsibilities means you simply can’t get to the campgrounds early, don’t worry. Setting up at night isn’t as difficult as you might think, if you’re following the other featured tips. Every campground will have a different set of rules to follow. It’s a good idea to stop by the visitor’s office and familiarize yourself with them before getting settled into camp. This is especially important for any rules regarding campfires, garbage disposal, off-limit zones, and any safety rules pertaining to the area (i.e. wildlife). Knowing what rules you need to follow can you save you from a visit from a park ranger. By not following the posted rules you may only get a warning, but serious offenses, like an open fire during a ban, can lead to an expensive fine. 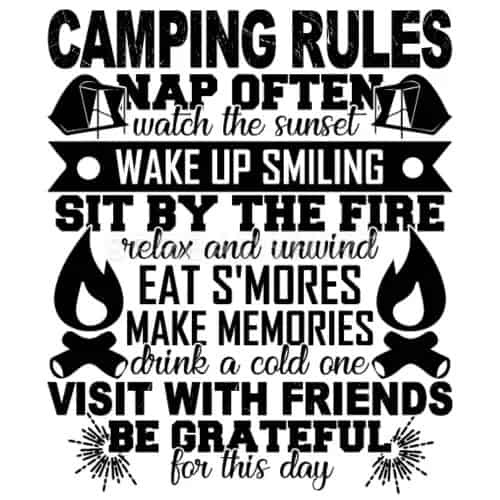 Be sure to also follow basic etiquette rules for all campgrounds. Be courteous to others, don’t litter, and try to keep the noise down after dark. Camping should be a positive experience, regardless of whether you’re going to relax or to hike around and have fun. If you’re new to camping and the outdoors in general, I highly recommend you use your trip as a way to learn about your region. Being able to ID wildlife, plants, and trees are valuable for anyone that plans to camp regularly and gives you insight into the environment around you. IDing flora and fauna can be done by bringing along field guides or by downloading apps on your phone. Some of these apps even allow you to take a photo of the object to help you ID it more accurately. Even though camping is far from boring when you do it right, there are times on longer trips where you might find yourself wanting something to do. This is weird a “bored box” or “bored bag” come in handy. The concept for a bored box/bag is to fill a container with items to keep you entertained. These can be books, board games, card games, a craft set, coloring books, campfire song lyrics, and any other fun item or game. A bored box is a great idea for adults and kids alike, but it’s basically a must-have for camping families. Solo camping is very rewarding, but it’s best to wait until you have some camping skills first. 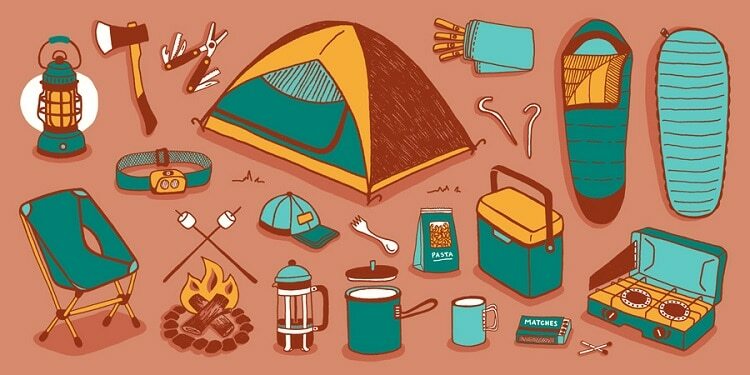 By going on group camping trips you’ll have help when it comes to setting up camp, gathering firewood, and cooking. Another thing to consider is by camping with others you’ll feel safer and have company. Many of us are always surrounded by people, whether it’s in-person or through social media. Suddenly being away in nature and not having others around can be pretty daunting. If you don’t have anyone to camp with, consider looking for local outdoor social groups. My best piece of advice for new campers is to remember that camping should be a fun, relaxing activity, even if those first couple trips have some hitches. Stay positive, follow these tips, and go with the flow! What did you think about these tips? Do you have any advice of your own to share with new campers? Leave a comment sharing your top tips or any stories of your first camping trip experience. If you think these tips will help out new campers you know, please share the article! After years of trying to convince our family friends to come camping with us, we have finally booked a trip together this year! I’m very excited to show them how fun camping but they are true urban folk and have never been camping in their lives… even as kids! Our family has camped in all weathers all over the UK but As you can imagine I don’t want to throw our friends in at the deep end and put them off camping, so This post was super helpful!